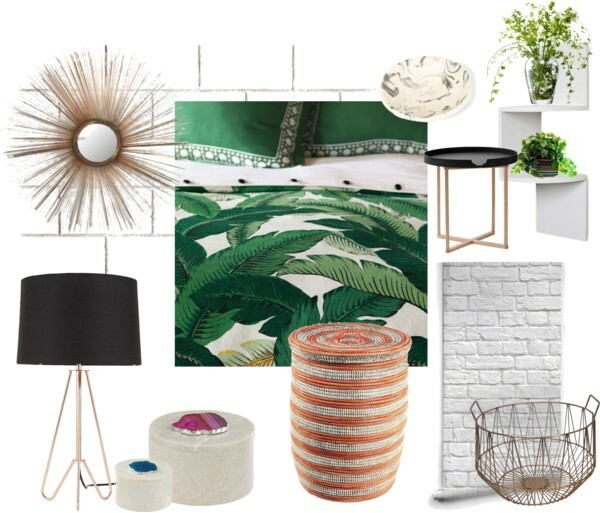 A Palm Leaf Print Inspired Bedroom | Finding delight. A palm leaf duvet cover serves as the anchor for the room and is perfect for cuddling up in on less-than-tropical mornings. A wallpaper to create the illusion of an exposed brick accent wall. A pair of round bedside tables to flank the palm leaf-ed bed. A zig-zag wall shelf as the perfect place for plants to live. A lamp for the dresser on copper tripod legs. A sunburst mirror to make a bold statement. A marble ring dish and agate boxes for storing tiny treasures. A bright hamper to keep dirty clothes off the floor. And a metal basket stows extra, cozy blankets and a stash of just-for-fun magazines. I am obsessed with plants and plant prints lately! Thank you for stoking my obsession haha. Me too! I just wish I felt like they went better with my current home decor….but maybe I’ll just go for it, lol. Pingback: A Rustic Bohemian Inspired Balcony | Finding delight.